He has been paid millions of dollars to play basketball in the NBA and has enjoyed a good deal of success in his nine seasons in the league. But truth be told, the favorite basketball moment for Al-Farouq Aminu did not take place on an NBA court. It may have come in Venezuela in 2012, when he helped Nigeria qualify for the first time for an Olympic Games. Or in London that summer, where Nigeria earned the first-ever Olympic basketball win by an African nation. Or in Nigeria this past summer, when the host team won a qualifying tournament that sends it directly to the World Cup in Shanghai next summer, another first. Or maybe it was when Aminu spent hours in a recreational gym in Ibadan — the hometown of his father — working with hundreds of Nigerian youths while helping promote the sport that has given him so much. "Playing on the (Nigerian) national team has been a dream come true," says Aminu, starting power forward for the Trail Blazers. "And connecting with the people of my father's country has been even better." Aminu was born and raised in Atlanta but holds dual citizenship with the United States and Nigeria. His father, Aboubakar Aminu, came to the U.S. from Nigeria at age 18 to attend Atlanta's Morehouse College. His mother, Anjirlic, is a U.S. native who went to Georgia State. Aminu's parents, who are Islamic, met in college and had three boys — Alade, 31; Al-Farouq, 28, and Al-Wajid, 20. Al-Farouq's nickname is "Chief," a derivative of his surname, Oloyed, which means "The chief has arrived" in the Hausa dialect of Nigeria. His paternal grandfather was once king of the city of Ibadan. Al-Farouq's father is only 6 feet tall. His mother is 5-11, so the maternal side is where the Aminu boys get their height. Alade, 6-11, starred at Georgia Tech and is currently playing in Israel in his 10th pro season overseas. The 6-7 Al-Wajid is a junior and a starting forward at North Florida in Jacksonville. 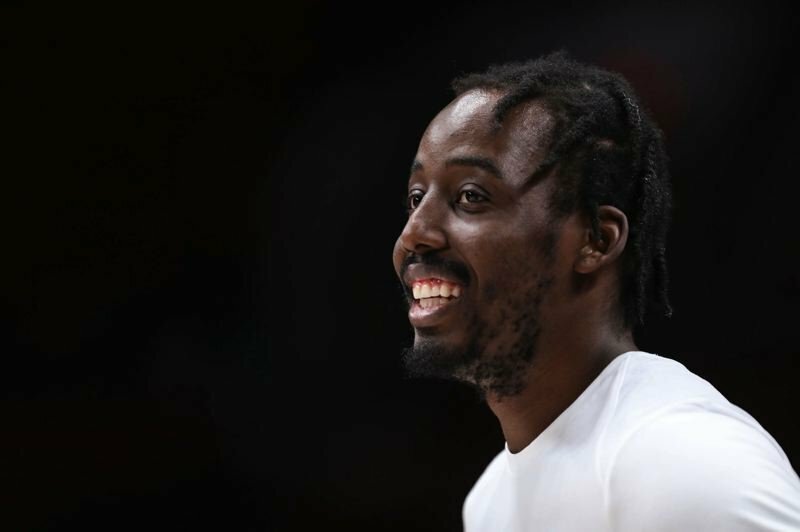 The 6-9 Al-Farouq is the best of the lot, starting for his two seasons at Wake Forest before being chosen by the Los Angeles Clippers with the eighth pick of the 2010 draft. Aboubakar Aminu never intended to stay in the U.S. after college. "His plans were to go back," Al-Farouq says. "He wanted to be a politician (in Nigeria). He liked political science. He always watched CNN. Then he met my mom." Aboubakar speaks fluent English, but had a little trouble communicating with his spouse, at least at first. "My dad speaks a different kind of English — King's English," Aminu says with a smile. "He used to always make fun of the way my mom spoke." Aboubakar, a high school teacher, and Anjirlic raised the boys together until they split up when Al-Farouq was a freshman in high school. Al-Farouq was "super close" to his older brother. "We used to do everything together," he says. "To this day, we're close. I'm close to (Al-Wajid), too, but there's more of an age difference. He can't talk about the same things that Alade and I do." During Aminu's rookie season with the Clippers, one of his teammates was Ike Diogu, whose parents were Nigerian-born. Diogu had committed to play for the Nigerian team that was to compete in the qualifying tournament for the 2012 Olympic Games. "He said, 'There is this tournament where if we win three games, we'll make the Olympics,'" Aminu says. "I said, 'That sounds too good to be true.'" Aminu had never visited Nigeria, but he did travel to South Africa and Zambia to take part in an NBA "Basketball Without Borders" camp in the summer of 2011. He was intrigued by the idea of representing his father's country, and also the opportunity play in the Olympics. Diogu helped line up Aminu and Alade for the Nigerian team that would go on to upset European heavyweights Lithuania and Greece in Venezuela to qualify for an Olympic berth. It was the first time an African basketball team had qualified for the Olympics and the first-ever victory by the Nigerian national team over a European team. "An unbelievable experience," says Aminu, who adds that the Lithuanians, in particular, "couldn't believe they'd been beaten by an African team." Nigeria went on to register a win over Tunisia — its first Olympic game victory — before being eliminated with a pair of losses. Aminu also played for the Nigerians in the 2013 and '15 AfroBasket Championships, helping his team win its first-ever AfroBasket title the latter year. "My track record with the national team was kind of heroic," Aminu says immodestly. "First time ever to make the Olympics; first time beating a European team; first time winning AfroBasket; first time winning a game in the Olympics. "We've done a lot, and the country is starting to take notice. For so many years in Nigeria, kids would run up to a soccer player (with admiration). Now, a lot of them are running up to us saying, 'I want to play basketball.' "
A bonus was that Aminu got the chance to be a teammate of his brother. "We'd never gotten to play together," he says. "It was fun to not have to compete against him. Growing up, we were very competitive. There was no bad blood — we liked competing against each other — but it was great to get to play with him for the first time." Aminu did not participate with the Nigerian team in the 2016 Olympics following his first season with the Blazers, primarily in protest that players weren't insured against injury. "There are a lot of things can go wrong," Aminu says. "It wasn't right for (athletes) to play for their country and not get any compensation or security for their health. The whole situation wasn't right. If guys don't have insurance, I didn't want to be a part of it." After several other players sat out the Games, says Aminu, the International Basketball Federation (FIBA) changed the rules to ensure all national-team players had insurance coverage. Aminu rejoined the national team last summer, helping the Nigerians to three straight wins to gain an automatic berth into the 32-team World Cup competition in Shanghai next summer. He'll play in the World Cup and in the 2020 Olympic Games at Tokyo, too, if the Nigerians make it there. Aminu made three trips to Africa last offseason. There was the World Cup qualifier in Nigeria in September. There was a visit to South Africa for Basketball Without Borders and "NBA Africa" week in August. And in July, he conducted his third annual youth basketball camp in Ibadan through the Aminu Good Works Foundation, run by Al-Farouq and his wife, Helina. Al-Farouq and Helina, an Ethiopian native, met while he was in college and she was attending Virginia Tech. They have been married four years and have a 3-year-old daughter, Emanah. The Aminus do not practice the Islamic faith. "We're more spiritual than religious," says Al-Farouq, though he says he fasts in the summer and observes Ramadan, the holy month on the Islamic calendar. The Aminus established their foundation in 2015, its mission to provide "health and educational support for underserved communities in Africa." Among other things, the foundation has provided support for a local orphanage in Ibadan, including food and educational needs. The past three years, Al-Farouq has focused on his basketball camp for ages 13-17 and on improving opportunities for youths playing the sport in Ibadan. "I do the camp in appreciation for all the things basketball has been able to do for me," he says. "I've had the opportunity to visit countries all over the world. I've been able to support myself and my family. It paid for my college. "I know what the game can do for someone, even if he doesn't make it to the NBA. My big brother was able to get his college degree. My little brother has had his college paid for." Aminu has arranged for quality coaching, housing and meals for campers at no cost. "I've bankrolled it, with some help from the NBA," he says. "There's a gym there to use, but we cleaned it up, polished the floors and redid the backboards. It's important, because many Africans have athleticism but they can't shoot or dribble well. That's just a lack of coaching and facilities. If you don't have a gym to shoot at every day, you're not going to be a good shooter." Aminu intends to stage a fundraiser in Portland next summer to help his foundation do its work. "I want to combine educational and basketball opportunities," he says. "Not many of (the Nigerian youths) will make the NBA, but a lot of them can get their college degrees. The education piece is crucial." Aminu wants to build an academy adjacent to a school in Ibadan run by an aunt. "We'll build out the gym and facilities," he says. "We'll begin the project within the next two to three years. When we get that, we can start kids playing basketball at a younger age. We'll get more kids who would have gone to soccer in the past. We're going to see more top-level players developed. "The point of our foundation is to reflect how I have been empowered by basketball. The game has given me opportunities. I want other kids to have that, too. That's what I'm looking to help them do." Aminu has now made "five or six" visits to Nigeria and says he will spend considerable time there after his NBA playing days are over. He and his wife — who is in the beginning stages of opening a studio in Portland — intend to put together an art gallery in Nigeria. "We'll host African artists," he says. "We feel African art is not celebrated enough." For the first time last summer, Aminu visited Ibadan with his father, whose own father had reigned as king of the city many years earlier. "The people there wanted me to meet the present-day king," Aminu says. "He told me he had known my grandfather. He was like, 'Wow.' That's how big my grandfather was. "Before we left on the trip, my dad told me he had lived on Aminu Street. I thought he was being funny. He wasn't. When we went there, I saw the palace he lived in. There's a mosque in the front. "My father was able to give me more insight on history and landmarks in the city. I'd met a few of my uncles, aunts and cousins, but I got to meet even more family on that trip. It was pretty cool." So, too, is what Aminu has done over the past six years in connecting with his second country. And there is more to come.